Very large and a very advanced bomber for its time, it included a pressurized cabin, an electronic fire-control system and remote-controlled machine-gun turrets. CBI - China: Day 153 of 154 of the Japanese Invasion of Manchuria. CBI - China: Day 21 of 41 of the 1st Battle of Shanghai. CBI - China: Day 48 of 142 of the 1st Battle of Hebei. Spain: Day 216 of 985 of the Spanish Civil War. Spain: Day 581 of 985 of the Spanish Civil War. CBI - China: Day 226 of 2,987 of the 2nd Sino-Japanese War. Day 11 of 124 of the Battle of Henan. Spain: Day 946 of 985 of the Spanish Civil War. CBI - China: Day 591 of 2,987 of the 2nd Sino-Japanese War. ETO: Norway protests to Britain over violation of neutrality due to yesterday's ALTMARK incident. Finland: Day 80 of 105 of the Russo-Finnish War. CBI - China: Day 956 of 2,987 of the 2nd Sino-Japanese War. Day 95 of 381 of the Battle of South Guangxi. Day 21 of 67 of the Battle of Wuyuan. ETO - UK: Day 165 of 258 of the Blitz. East Africa: Day 253 of 537 of Italy's East African campaign in the lands south of Egypt. East Africa - Eritrea: Day 13 of 56 of the Battle of Keren. CBI - China: Day 1,322 of 2,987 of the 2nd Sino-Japanese War. Day 19 of 31 of the Battle of South Henan. CBI - Thailand: Day 140 of 221 of the Franco-Thai War (Vichy France vs Thailand). 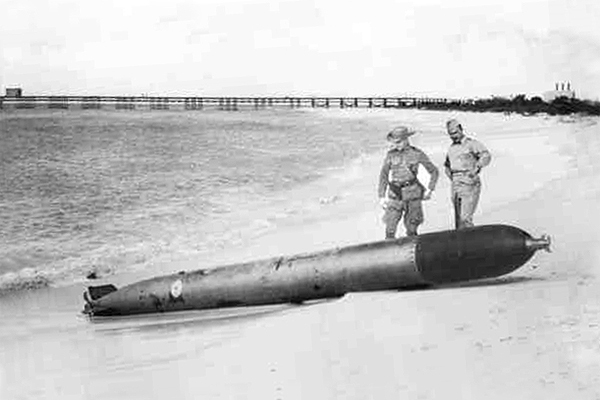 Caribbean: Dutch attempt to disarm an unexploded torpedo on the island of Aruba, launched by German submarine U-156 during the prior day's attack. The torpedo detonates unexpectedly, killing 4 Dutch Marines. Aruba: Torpedo fired on 16 Feb 42 by U-156 at the tanker Arkansas, missed and berthed unexploded on Eagle Beach. It is being inspected here by Dutch and US Army officers. Unfortunately, 4 Dutch Marines attempting later to disarm it, are killed when it unexpectedly explodes. Atlantic: Day 35 of 169 of Germany's Second "Happy Time," during which U-boats sink 609 Allied ships with little risk. A German vessel disguised as a British merchantman is reported sunk by a U-boat off the Azores. Russian Front - North: Day 163 of 872 of the Siege of Leningrad. Russian Front - North: Day 10 of 102 of the Battle of the Demyansk Pocket, another failed attempt to break the siege at Leningrad. Russian Front - North: Day 26 of 103 of the Battle of the Kholm Pocket. Another attempt to break the siege at Leningrad. Russian Front - Center: Day 41 of 103 of the Battle of Vyazma, Russia. Russian Front - Center: Day 41 of 103 of the Battle of Sychevsk, Russia. Russian Front - South: Day 111 of 248 of the Siege of Sevastopol, Crimean Peninsula. All German attacks against Sevastopol are stopped for the winter. CBI - Burma: Day 66 of 164 of Japan's Invasion of Burma. CBI - Burma: Day 4 of 5 of the Battle of the Bilin River. CBI - China: Day 1,687 of 2,987 of the 2nd Sino-Japanese War. Day 56 of 99 of the 3rd Battle of Changsha. PTO - Borneo: Day 64 of 107 of the Battle of Borneo. PTO - Philippines: Day 72 of 152 of the 1st Battle of the Philippines. 5th Air Force provides air support. ETO - UK: US 8th Air Force: Flying Spitfires, the 4th Fighter Group patrols the Channel during the day. Russian Front - North: Day 528 of 872 of the Siege of Leningrad. Russian Front - North: Day 8 of 51 of the USSR's Operation POLAR STAR, a failed offensive north of Leningrad, hoping to take the southern shore of Lake Ladoga, Russia. Russian Front - North: Day 289 of 658 of the Siege of the Kholm Pocket, USSR lays siege to the Kholm Pocket but the Germans hold out for a about a year and a half. Russian Front - South: Day 68 of 69 of the USSR's Operation LITTLE SATURN. A successful drive into the Northern Caucasus and the Donets Basin pushing the Axis troops out. MTO - Tunisia: Day 93 of 178 of the Battle of Tunisia. MTO - Tunisia: Day 4 of 4 of the Battle of Sidi Bouzid. Allies have evacuated Sidi Bouzid and Sbeitla allowing the Axis troops to move in. The British 8th Army occupies Medenine. The German 5th Panzer advance beyond the Kasserine Pass becomes temporarily suspended. RAF and US Air Forces provide Allied air support. CBI - Burma: Day 59 of 104 of the 1st Battle of Arakan. US 10th Air Force provides air support. CBI - Burma: Day 10 of 79 of the Allied Operation LONGCLOTH. CBI - China: Day 2,052 of 2,987 of the 2nd Sino-Japanese War. PTO - Alaska: Day 256 of 435 of the Battle of Kiska, Aleutian Islands. PTO - New Guinea: US 5th Air Force B-24s bomb Gasmata Airfield, Pondo Harbor, Bobo and the sawmill at Ubili. PTO - Solomon Islands: US 13th Air Force and US Navy fighters attack Munda Airfield on New Georgia Island. B-24s bomb on Nusave Island, Ballale Island and on Bougainville Island. Russian Front - North: Day 654 of 658 of the Siege of the Kholm Pocket. USSR lays siege to the Kholm Pocket but the Germans hold out for a about a year and a half. Russian Front - North: Day 35 of 48 of the Battle toward the Narva River, Estonia. This drive helped lift the Leningrad siege and goes on to liberate Narva. Russian Front - North: Day 16 of 191 of the Battle of the Narva Isthmus, Estonia. Russian Front - South: Day 56 of 113 of the USSR's Dnieper-Carpathian Offensive in southwestern Ukraine. Russian Front - South: Day 19 of 31 of the Battle of Nikopol, Ukraine. Russian Front - South: Day 25 of 25 of the Battle of the Korsun Bulge in Ukraine. This ends as a Soviet victory. The German troops were able to break out and leave, but at a very heavy price. MTO - Italy: Day 32 of 123 of the Battle of Monte Cassino. US 12th and 15th Air Forces continue to bomb Monte Cassino Abbey for the third day in a row, destroying it completely. MTO - Italy: Day 27 of 136 of the Battle of Anzio. Germans launch a seven division counter-attack against the US 5th Army at the Anzio beachhead. RAF and US Air Forces provides air support for the Allied ground troops. CBI - Burma: Day 50 of 99 of the 2nd Battle of Arakan. CBI - Burma: Day 13 of 19 of the Battle of the Admin Box. US 10th Air Force provides air support. CBI - China: Day 2,417 of 2,987 of the 2nd Sino-Japanese War. CBI - Indochina: US 14th Air Force attacks railroads and shipping in the Gulf of Tonkin. PTO - Caroline Islands: Day 2 of 2 of the Naval Battle of Truk. US carrier planes destroy this Japanese naval base. PTO - Marshall Islands: Day 2 of 8 of the Battle of Eniwetok. US 7th Air Force provides air support. PTO - New Guinea: Day 152 of 219 of the Battle of Shaggy Ridge. 5th Air Force provides air support. PTO - New Guinea: Day 149 of 162 of the Battle of the Huon Peninsula. 5th Air Force provides air support. PTO - New Guinea: Day 65 of 597 of the Battle of New Britain. US 13th Air Force provides air support. PTO - Solomon Islands: Day 109 of 295 of the Battle of the Bougainville Islands. US 13th Air Force provides air support. ETO - France: Day 201 of 284 of the Battle of Brittany. ETO - France: Day 156 of 236 of the Siege of Dunkirk. ETO - Germany: Day 10 of 16 of Operation GRENADE, the US drive into Germany. US 9th Air Force provides air support. ETO - Germany: Day 10 of 17 of Operation VERITABLE, the British and Canadian drive into Germany. ETO: Day 29 of 66 of the Battle to the Rhine. US 3rd Army launches a new offensive into Germany, having pierced the Siegfried Line on a 11-mile front. US 9th Air Force provides air support. ETO - Germany: US 8th Air Force B-17s and B-24s hit targets at Frankfurt, Giessen, Aschaffenburg and Hanau. Russian Front - Finland: Day 156 of 223 of the Lapland War. Finland and Russia have joined forces to kick the Germans out of Finland's most northern province. Russian Front - Center: Day 126 of 206 of the Battle of the Courland Pocket in Latvia. Russian Front - Center: Day 24 of 75 of the Battle of Königsberg, East Prussia (now Kaliningrad, Russia). Russian Front - Center: Day 23 of 63 of the Battle of the Heiligenbeil Pocket in East Prussia. Russian Front - Center: Day 8 of 54 of the Battle of East Pomerania, Germany. Russian Front - Center: Day 10 of 17 of the USSR's Lower Silesian Offensive (Poland). Russian Front - Center: Day 5 of 83 of the German Siege of Breslau (today Wroclaw, Poland). Russian Front - Center: Day 17 of 31 of the Battle of Schwedt, Germany. MTO: US 15th Air Force B-17s and B-24s attack targets in Austria, Italy, and Yugoslavia. CBI - Burma: Day 30 of 61 of the Battles of Meiktila and Mandalay. The US 10th Air Force provides air support. CBI - Burma: Day 28 of 39 of the Battle of Ramree Island. The US 10th Air Force provides air support. CBI - Burma: Day 14 of 99 of the Battle of Pakokku and Irrawaddy River operations in central Burma. The US 10th Air Force provides air support. CBI - China: Day 2,783 of 2,987 of the 2nd Sino-Japanese War. PTO - Alaska: US 11th Air Force B-25s provide air coverage for a naval task force en route to Paramushiru Island. PTO - Japan: US 7th Air Force bombs targets on Iwo Jima in preparation for the upcoming amphibious invasion. PTO - New Guinea: Day 418 of 597 of the Battle of New Britain. PTO - New Guinea: Day 302 of 481 of the Battle of Western New Guinea. PTO - Philippines: Day 121 of 299 of the 2nd Battle of the Philippines, aka the Liberation of the Philippines or the Philippines Campaign. PTO - Philippines: Day 65 of 244 of the Battle of Luzon. 5th Air Force provides air support. US paratroopers land on Corregidor Island. PTO - Philippines: Day 18 of 22 of the Battle of the Bataan Peninsula. 5th Air Force provides air support. Except for a few small isolated pockets, US troops capture the whole of the Bataan Peninsula. PTO - Philippines: Day 15 of 29 of the Battle of Manila. Italy: The British Military Court conducts a trial in Venice for Field Marshal Albert Kesselring, commander of the German forces in Italy since 21 Nov 43, on counts of shooting 335 Italians in the Ardeatine massacre and incitement to kill Italian civilians. The ways that we, as individuals and as members of a society, make distinctions between "us" and "them," right and wrong, good and evil. A fascinating history of the war through the words of the men who took it direct to the heart of both Germany and Italy, men who risked their lives daily in the search for freedom for occupied Europe.